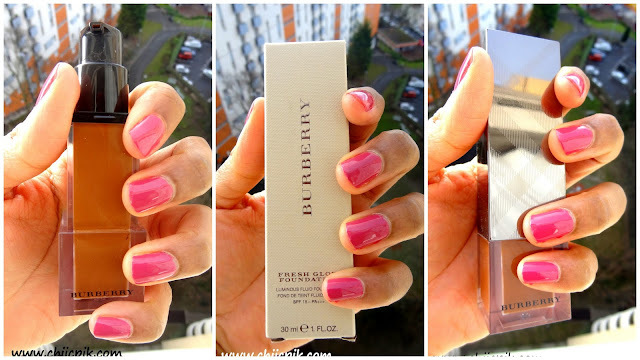 Hello readers, today I want to review the "Fresh Glow" foundation by Burberry which I bought last year in fall (2015). I apply with my fingers. For a medium/full coverage I add one more pump and focus on the areas of my face which need more coverage with a dense brush. The foundation itself has a light creamy texture that is very easy to blend. They have a nice range of colors; 14 colors to be exact. I use the color n°64 Mocha and there is one more darker shade (n°66 /deep brown) on their website. The color I bought has a good mix of yelow and red undortone which works perfect for my complexion. So for once I don't have to mix foundations. It is a perfect match! Burberry Fresh Glow foundation provides a buildable medium coverage for a flawless and dewy glow. It instantly enhances luminosity, gives a natural looking finish without hiding the skin. Lightweight and moisturising it leaves skin feeling hydrated and soft. I agree with everything that the brand states. I have combination/oily skin but during the cold months my skin is less oily and this foundation works for me. But I would not recomment it for those who have very oily skin. The finish is VERY natural. I can not see this foundation sitting on my skin even with a magnifying mirror. With one application (2 pumps for me) you'll get a medium coverage that you can easily build up without getting a cakey finish. If you want to add more layers to get a better coverage the finish is going to stay natural. And that is what I really like. Have you ever used it? What do you think about it?